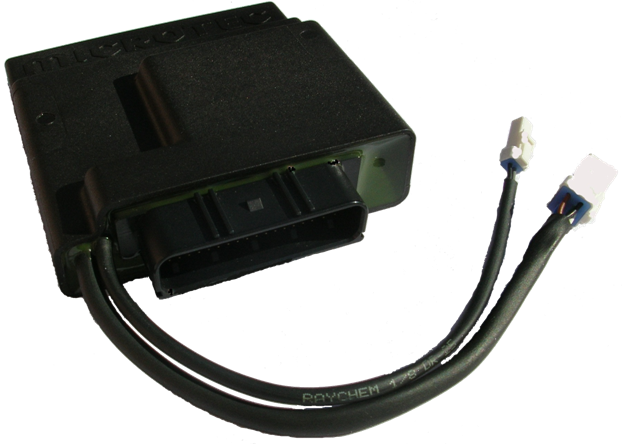 An engine control unit (ECU), now called the powertrain control module (PCM), is a type of electronic control unit that controls a series of actuators on an internal combustion engine to ensure optimal engine performance. It does this by reading values from a multitude of sensors within the engine bay, interpreting the data using multidimensional performance maps (called lookup tables), and adjusting the engine actuators accordingly. Before ECUs, air/fuel mixture, ignition timing, and idle speed were mechanically set and dynamically controlled by mechanical and pneumatic means. One of the earliest attempts to use such a unitized and automated device to manage multiple engine control functions simultaneously was the "Kommandogerät" created by BMW in 1939, for their 801 14-cylinder aviation radial engine. This device replaced the 6 controls used to initiate hard acceleration with one control in the 801 series-equipped aircraft. However, it had some problems: it would surge the engine, making close formation flying of the Fw 190 somewhat difficult, and at first it switched supercharger gears harshly and at random, which could throw the aircraft into an extremely dangerous stall or spin. For an engine with fuel injection, an engine control unit (ECU) will determine the quantity of fuel to inject based on a number of parameters. 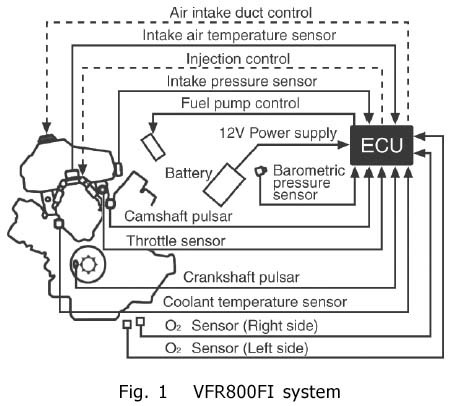 If the throttle position sensor is showing the throttle pedal is pressed further down, the mass flow sensor will measure the amount of additional air being sucked into the engine and the ECU will inject fixed quantity of fuel into the engine ( most of the engine fuel inlet quantity is fixed). If the engine coolant temperature sensor is showing the engine has not warmed up yet, more fuel will be injected (causing the engine to run slightly 'rich' until the engine warms up). Mixture control on computer controlled carburetors works similarly but with a mixture control solenoid or stepper motor incorporated in the float bowl of the carburetor. A spark ignition engine requires a spark to initiate combustion in the combustion chamber. 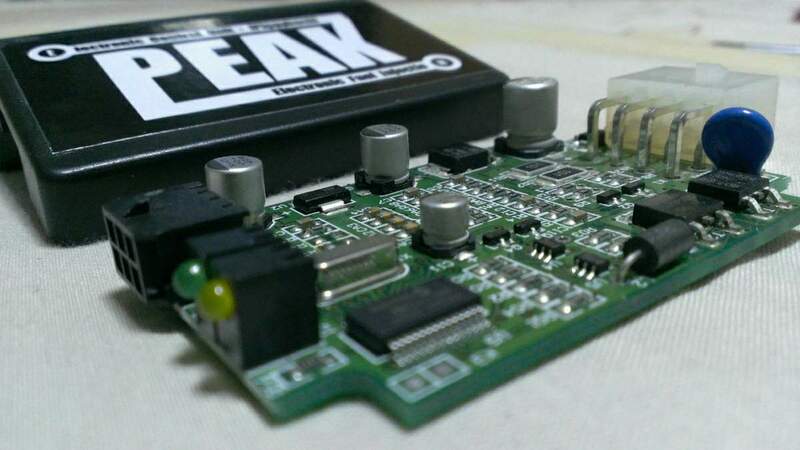 An ECU can adjust the exact timing of the spark (called ignition timing) to provide better power and economy. If the ECU detects knock, a condition which is potentially destructive to engines, and determines it to be the result of the ignition timing occurring too early in the compression stroke, it will delay (retard) the timing of the spark to prevent this. Since knock tends to occur more easily at lower rpm, the ECU may send a signal for the automatic transmission to downshift as a first attempt to alleviate knock. Most engine systems have idle speed control built into the ECU. The engine RPM is monitored by the crankshaft position sensor which plays a primary role in the engine timing functions for fuel injection, spark events, and valve timing. Idle speed is controlled by a programmable throttle stop or an idle air bypass control stepper motor. Early carburetor-based systems used a programmable throttle stop using a bidirectional DC motor. Early TBI systems used an idle air control stepper motor. Effective idle speed control must anticipate the engine load at idle. Some engines have Variable Valve Timing. In such an engine, the ECU controls the time in the engine cycle at which the valves open. The valves are usually opened sooner at higher speed than at lower speed. This can optimize the flow of air into the cylinder, increasing power and the economy. The first production engine of this type was invented ( in 2002) and introduced (in 2009) by Italian automaker Fiat in the Alfa Romeo MiTo. Their Multiair engines use electronic valve control which drastically improve torque and horsepower, while reducing fuel consumption as much as 15%. Basically, the valves are opened by hydraulic pumps, which are operated by the ECU. The valves can open several times per intake stroke, based on engine load. The ECU then decides how much fuel should be injected to optimize combustion. For instance, when driving at a steady speed, the valve will open and a bit of fuel will be injected, the valve then closes. But, when you suddenly stamp on the throttle, the valve will open again in that same intake stroke and much more fuel will be injected so that you start to accelerate immediately. The ECU then calculates engine load at that exact RPM and decides how to open the valve: early, or late, wide open, or just half open. The optimal opening and timing are always reached and combustion is as precise as possible. This, of course, is impossible with a normal camshaft, which opens the valve for the whole intake period, and always to full lift. And not to be overlooked, the elimination of cams, lifters, rockers, and timing set not only reduces weight and bulk, but also friction. A significant portion of the power that an engine actually produces is used up just driving the valve train, compressing all those valve springs thousands of times a minute. Once more fully developed, electronic valve operation will yield even more benefits. Cylinder deactivation, for instance, could be made much more fuel efficient if the intake valve could be opened on every downstroke and the exhaust valve opened on every upstroke of the deactivated cylinder or "dead hole". Another even more significant advancement will be the elimination of the convention throttle. When a car is run at part throttle, this interruption in the airflow causes excess vacuum, which causes the engine to use up valuable energy acting as a vacuum pump. BMW attempted to get around this on their V-10 powered M5, which had individual throttle butterflies for each cylinder, placed just before the intake valves. With electronic valve operation, it will be possible to control engine speed by regulating valve lift. At part throttle, when less air and gas are needed, the valve lift would not be as great. Full throttle is achieved when the gas pedal is depressed, sending an electronic signal to the ECU, which in turn regulates the lift of each valve event, and opens it all the way up. "A typical Kawasaki or Suzuki off-road ECU"